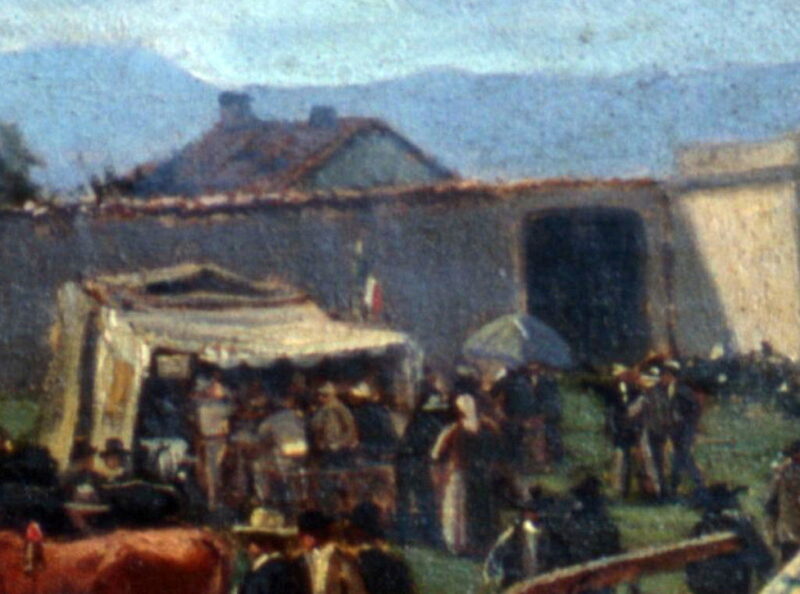 ENRICO SARTORI, Scena di mercato, detail, (Parma, Galleria Nazionale). Starting in the year 1000, the Market of San Bartolomeo was held in this quiet, small square nestling up to the ancient church of San Bartolomeo (already here in 833 AD), outside the walls but very close to the city’s commercial centre. Together with the nearby Saint Alexander Market it comprised the Abbot’s Markets, where products from the monasteries’ farms were sold. The narrow streets that connected it with Strada dei Mercanti (now via Mazzini) was lined with taverns and inns, such as “Fortuna” and “Tre Re”, in borgo San Bartolomeo, “La Rosa”, “Due Colonne”, “Tre Corone”, “Croce Verde”, “Aquila Nera”, “Gallo” (which gave its name to the street leading to the Steccata church), and “Stella d’Oro”. Nowadays the market square extends into a larger one overlooked by several shops selling typical local products.